The Abbeys Amble is a long-distance path in North Yorkshire, England. It is a circular walk of 103 miles (165 km), starting and ending at Ripon Cathedral. It links three abbeys, Fountains Abbey, Bolton Abbey and Jervaulx Abbey, and three castles, Ripley Castle, Bolton Castle and Middleham Castle. We will also endeavour to include all these in any custom itinerary you wish to build for this walk. * All headline holiday prices are shown per person, based on two people sharing. Baggage Transfer is automatically included in the price of all our Walking Holiday packages. These prices are for anyone planning their own holiday and just need bags moving from one stop to the next. Note: If you are booking accommodation in an Airbnb, you must ensure that there will either be someone available to take collection/delivery of your bags or that they have appropriate, secure storage in the event that the proprietor is absent. Solo travellers please contact us or use the booking form to send your proposed itinerary including dates, and we will price accordingly. 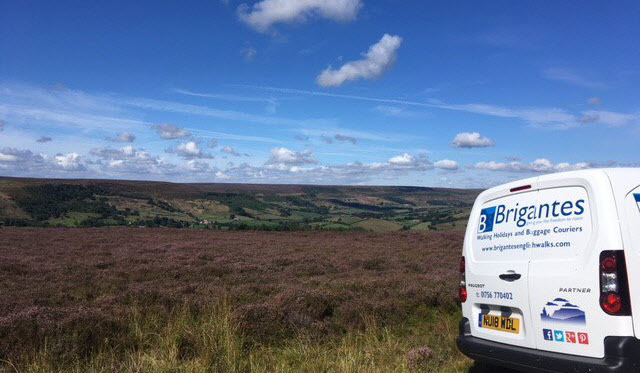 Where possible, we take advantage of existing bookings from other clients to ensure you receive a cost effective service. For alternative itineraries to those provided for this route, please contact us, or use the Booking Form to submit your proposed itinerary and number of participants and we will quote accordingly. Prices are based on the walk starting after 1st April and ending before 30th September. For walks outside those dates, please contact us. We provide a reduced out of season service, but still manage to meet the needs of most customers who contact us during this period. The Abbey’s Amble is a long-distance path in North Yorkshire, England. It is a circular walk of 103 miles (165 km), starting and ending at Ripon Cathedral. It links three abbeys, Fountains Abbey, Bolton Abbey and Jervaulx Abbey, and three castles, Ripley Castle, Bolton Castle and Middleham Castle. Digital Maps can be viewed on a modern smartphone using an appropriate ‘app’, which is usually provided as part of any map purchase. Brigantes are happy to recommend ViewRanger for all your digital mapping and mobile navigation needs. The ViewRanger Shop provides Ordnance Survey maps for all parts of the UK, as well as the National Trail and selected Long Distance Paths. Map segments can also be purchased ad-hoc, allowing you to cover any walk you plan to take. Have you walked this route? Please leave a review and let others know what you think. Use the comments form below to submit your testimonial for this walk. Rest assured, we won’t display or disclose your email address! It is only required to prevent spam – and to enable you to receive notifications of any responses to your review should you select the option to do so.